Where to stay when you're departing or arriving in Venice by cruise ship. ABOVE: Are you cruising to or from the Marittima ship basin? The Hotel Santa Chiara may be your best choice, especially if you're traveling with bulky luggage. It's on the edge of the Piazzale Roma, with bridge- and step-free access to airport buses, taxis, and the inexpensive People Mover automated tram to Marittima. BELOW: The yellow labels indicate hotel areas discussed in this article. If you have a fast Internet connection, click here for a larger image. In a hurry? See 10 hotels closest to cruise ships. 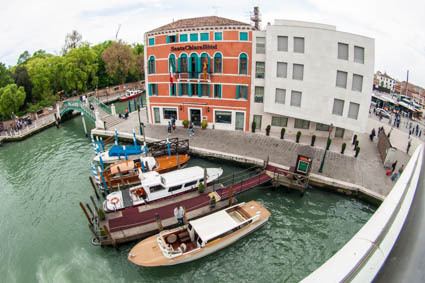 If you're a cruise passenger and you're arriving or departing at the Venice Cruise Terminals (Terminal Venezia Passeggeri), staying at a hotel near the ship will save you money, huge amounts of hassle, or both. Read our "No. 1 Warning!" article before making the mistake of booking a room in the wrong part of town. In a city with narrow, crowded pedestrian streets and more than 400 footbridges, you do not want to wrestle heavy luggage any farther than you absolutely must. Large ships (such as Princess and Costa ships) invariably use the main Marittima basin, which has several terminals. Marittima is located just south of where the road bridge from the mainland enters the city. It's about a 15-minute walk, a 5-minute taxi or shuttle-bus ride, and an even quicker People Mover ride from the Piazzale Roma, the final destination for buses and taxis that enter Venice. Small to midsize ships up to about 50,000 tons (such as Silversea's Silver Spirit or Compagnie du Ponant's L'Austral) sometimes use the Marittima basin as well. However, such ships are often assigned to the San Basilio terminal or its extension, the Santa Marta pier. These are on the Giudecca Canal (right below a pedestrian promenade called the Zattere, which extends all the way up to a triangular point opposite St. Mark's Basin). Very small ships nearly always arrive and depart at San Basilio or (in the case of river ships) Santa Marta, which is an extension of the San Basilio pier. 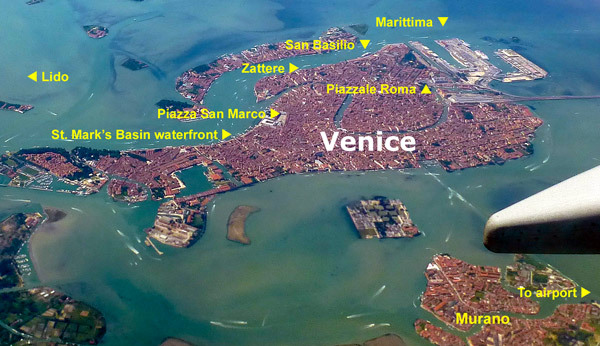 If you aren't sure where your ship will be moored, see the Ship Schedule at the Terminal Venezia Passeggeri Web site. Piazzale Roma. Stay here if your ship uses the Marittima basin, or if your ship uses the San Basilio terminal and you want to transfer by taxi. Piazza San Marco. Prices tend to be higher in this area of the city. The Piazza San Marco is served by the Alilaguna airport boat's Blue Line, which connects Marco Polo Airport with the city center and the Marittima cruise basin. St. Mark's Basin waterfront. The Alilaguna Linea Blu airport boat also stops at the San Zaccaria and Arsenale vaporetto landings, making it easy to reach both the airport and Marittima from the waterfront promenade that runs east from the Piazza San Marco. San Basilio. Stay at one of these hotels if your ship uses the San Basilio or Santa Marta pier and you don't mind walking a few blocks with a small bridge or two along the way. The Lido di Venezia and Murano. Hotels on the Lido (Venice's beach-resort island) tend to be quite a bit cheaper than hotels in the historic center, and many are close to the waterbus pier over level ground, with no footbridges to cross. The small glassmaking island of Murano is a pleasant place to spend a night away from Venice's hustle and bustle. Both islands are served by Alilaguna airport boats that go directly to the Marittima cruise basin. Another possibility is to spend a night or two in Mestre, on the Venetian mainland. This is especially convenient if you're traveling with heavy luggage, since you won't need to walk far or cross bridges. If your luggage is bulky or heavy, consider taking a land taxi to your ship. The fare between downtown Mestre and either the Marittima or San Basilio cruise terminal shouldn't be more than €30-40. Well-heeled cruise passengers often stay at the Hilton Molino Stucky, which is located on the island of Giudecca. The hotel occupies part of a restored flour mill from the late 19th Century. Note: The Hilton Molino Stucky's location isn't especially convenient to Venice's main sights (you'll need to take the free shuttle boat from the hotel to the Piazza San Marco, for example), but an Alilaguna airport boat does offer service between the hotel and the main Marittima cruise terminal, and you can take the No. 2 vaporetto to the San Basilio pier (one stop away from the hotel).